Maintained by Robin Tecon, microbiologist and postdoctoral researcher at the Swiss Federal Institute of Technology Zürich. This blog is about bacteria (and other microbes) and the scientists who study them. 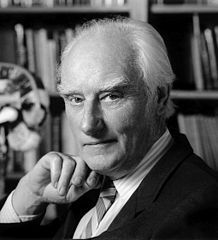 Every biologist knows that Francis Crick is the co-discoverer of the structure of DNA. What is less known, probably, is the fact that Crick was a proponent of a theory that stands at the border of science, the theory of directed panspermia. In 1973, Crick (together with chemist Leslie Orgel) published an article describing the theory, and in 1981 he dedicated a full book to directed panspermia, entitled Life itself. According to Crick, the idea of panspermia – which means “seeds everywhere” – was proposed by the physicist Arrhenius at the end of the 19th century. Arrhenius suggested that life on Earth originated from space, that our world was seeded by spores of micro-organisms traveling between planets. But because the radiations in space were thought to be too intense for the spores to survive, Crick and Orgel postulated a variant of the theory in which spores were transported by an interplanetary spaceship sent by an alien civilization! Life itself is a short, very engaging book in which Crick takes the time to explain some basic features of cosmology, chemistry and biology throughout the first chapters. Because he knows that directed panspermia is stretched across the very border of science, Crick adopts a somewhat skeptical viewpoint, trying to examine and refute the arguments of the theory. But gradually, once the objections are carefully lifted one by one, he feels confident to say that directed panspermia is at least possible and, more importantly, not totally improbable. Thus, at the end of the book he speculates freely in chapters with amusing titles such as “what would they [the aliens] have sent?” and “the design of the rocket”! Crick rightly points out that the fact that life exists in the universe (we’re here!) does not tell us anything about the probability of life’s emergence. It could be, argues Crick, that life is an extremely rare phenomenon. 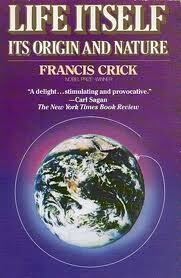 From that statement, Crick moves on to the likelihood that other planets in the universe may be suitable for life. Here he makes a lot of assumptions, but offers only very little experimental evidence. [That’s not surprising, given that no exoplanet had been described in 1981! I suppose Crick was delighted to follow the planet discoveries of Michel Mayor, starting in 1995.] Thus, after a lot of guesses, Crick comes with an estimation of (p.105) “a million planets in our galaxy on which we might hope to find oceans of thin organic soup waiting for life to get going.” Apparently, based on modern research, this number could be much higher! So Crick is probably on the safe side with his estimate. What he wants to show here, obviously, is that life could have begun on another planet than Earth. His next move is to show that there was ample time since the beginning of the universe for another highly developed civilization to appear. But what such a civilization would have sent? interrogates Crick. His guess: a mixture of bacteria (for example cyanobacteria) and eukaryotes (something like yeast), which can be packed by billions in a relatively small volume, and which can survive space travel better than any known organism. Finally Crick confronts two explanations for life on Earth. In the first one, life originated on Earth from the primitive soup, without external help. The second is directed panspermia (DP). How can he decide between them? He can’t really, though he tries to grant points in different categories. For instance, Crick sees the uniformity of the genetic code as a support for DP. Another point granted to DP comes from the fossil record: the oldest fossil microbes are indeed very old and resemble cyanobacteria. However, Crick sees the absence of eukaryotes in the ancient fossil record somewhat as an argument against DP. I already wrote about Crick’s interest in the origin of life in this post, and directed panspermia represents an interesting complement to his reflections on the topic. But despite Crick’s defense of directed panspermia as a valid scientific theory – or at least as a premature theory that will fully expand in the future –, it is difficult not to see it as a purely speculative attempt. An exciting, interesting idea, yes, but without a chance to be proved or disproved. And this, if we are to follow Sir Popper’s falsification test, puts it right off science’s lawn. Crick F. H. C. & Orgel L. E. (1973). Directed panspermia. Icarus 19: 341-346. Crick F. (1981). Life itself. Simon & Schuster, 192 p.
As a chemistry student i'm currently working on a philosophy assignment and i chose DP as the subject of my essay. Specifically i'm looking at the ethical questions if we would ever try to seed other planets. Thanks for this nice little read of the interesting idea that is DP. The last chapter of Life itself is entitled "Should we infect the galaxy?" and deals with ethical questions! If you can, get a copy of the book! Sounds to me like a fairy tale of Johnny Appleseed on earth gone multi-universe. Give me a break!!! So, you have a more credible theory, other than " God Said, Be, and so It Was"? "Based on my reading and observation/deep thinking, it seems like DNA/RNA were deliberately designed and then programmed into the first proto-cells billions of years ago, and then these cells were let loose on Earth, pitted against the elements and changing environs, thus leading to natural selection and adaptation. Darwin's theory of natural selection offers a very limited view of how species evolved, and any amount of thinking will clearly display that the varied forms of life on the planet could not have just arisen by natural selection from a common ancestor. THERE HAS TO BE A FORCE AT WORK TO ENGINEER THE FIRST NUCLEIC ACIDS AND THEN CAUSING DRAMATIC SPECIATION AT VARIOUS POINTS IN TIME! Please note I used the word " Force", since I do not believe any of the world's organized religions or their God/gods/goddesses or scriptures stand up to common, rational sense or very rudimentary science They were all made up by men/people to fill in the gaps and make sense of the world as they saw it thousands of years ago, to offer an explanation, an incredulous one, at that. For me, it is way more likely that an advanced race of beings/ entities created the " Life Experiment" on Earth billions of years ago, and then let the cells loose to see how this game of survival proceeds, and populations evolve, to maybe help with their own data gathering and experimentation. The panspermia theory alludes to this possible fact as well. I could never have fathomed that I would actually seriously consider this idea, but after much study and deliberation, it stands out as a very strong possibility to me. Please share your thoughts.